Foreman: I believe, in hard times, we need art more than usual. It lifts us up. It reminds us that life is about more than worry and drudgery. It is about ideas, and imagination, and beauty. Reporter's Note: One of the reasons I would like to be President is just to live with some of that glorious art in the White House. But who knows? Maybe the president will read this letter and decide to invite me over for a tour. Many years ago I interviewed an old woman with an absolutely jaw-dropping art collection, filled with magnificent pieces. Many were from huge names like Monet and Picasso, and just as many were from people you’ve probably never heard of. (Well, maybe you have, but I haven’t.) She was donating her collection to a museum and they were very excited, and as we walked through she explained where each piece came from and what she liked about it. The collection was worth millions, but you could see that the real value was in her heart; in a lifetime of joy that came from seeing art that she loved on her walls, and sharing it with others. I decided that day that I would buy art, too. Mind you this was back when I barely had enough money to buy sneakers. But I decided that I wanted some of that joy in my own life. And I have never regretted it. I have purchased small paintings and drawings that cost almost nothing, and I have bought others that cost much more. My wife and I have covered our walls with them: A mod, green horse looking over a shining river, a classic western stream shimmering, the rolling hills of the Great Plains, a girl reading a book, a stringer of fish from Russia, and on it goes. I don’t know how many we have, and I don’t know how much they are worth. Probably not much really. But they are priceless to our family. I mention all this, because in the midst of our trip down to the Gulf this week for our Building Up America series I bought two small paintings by local artists. One is of a mountainside (tres impressionistic) and the other is a sort of…hmmm, how do I describe it? 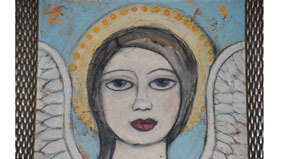 A modernistic, primitive, representational, whimsical angel of sorts. The artists, respectively, are Lori Gordon and Michelle Allee. The paintings did not cost much and it was money well spent. Not just because I like them, but also because artists need encouragement in hard times just as much, heck maybe a lot more, than other folks. And I believe, in hard times, we also need art more than usual. It lifts us up. It reminds us that life is about more than worry and drudgery. It is about ideas, and imagination, and beauty. So next time you visit the coast, or for that matter, any beleaguered community, I have a suggestion: Have one of your aides who has a sense of your taste go buy a piece of art from a local artist. There is so much talent out there, I am sure they can find something wonderful. Then show it off before you leave. Brag a little on how much you like it. Encourage the arts by example. Because they need it, and we need them now more than ever before. I hope all is well. If you want to come over and see the paintings when I get home, just give me a buzz. Lori is a family friend and an amazing person. The artists at 220 Main show the soul of the community. Through Katrina and now through this atrocity, they bring us all hope. You and your family sound like lovely people. It's always appreciated when people have bought my paintings at gallery or museum shows. Some are difficult to part with, so it means all the more if the patron is interested in the story or thought behind the composition. Our family has a menagerie of works be it adult artists, our artist children or yours truly. There's a medium for everyone, if they have the patience. Essays seems to be yours. Who knows, maybe the President has read some! Thank you for your writing, Tom : ) I read your letters everyday, some of them can be considered arts. Priceless. Lessons. Joy. Fun. And some about politics (which I am not a fan of :), but I read them all).